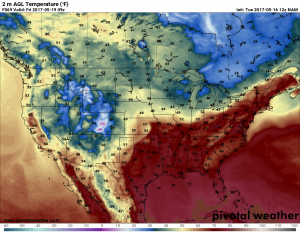 After a handful of warm, dry and pleasant spring days, Colorado is about to remind us why spring is a rollercoaster of weather in our state. 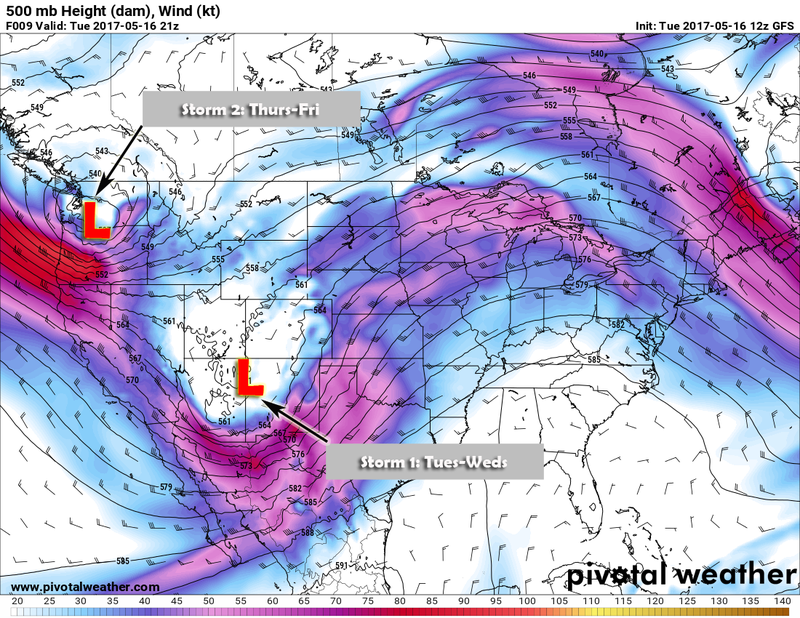 Two storm system will begin to roll through, the first making an impact as early as Tuesday afternoon and the second moving into the area late Wednesday and early Thursday. 500mb upper air model for 3PM on Tuesday. 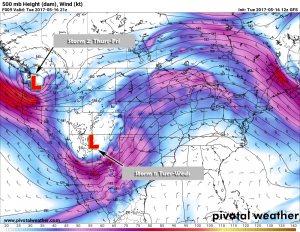 The first trough is set to arrive this afternoon and evening in Colorado, you can see form the image above it is over the four corners area by around 2PM. This first system is not expected to have a lot of power behind it but will have enough lift to create scattered showers and thunderstorms. The highest chance for those storms will be in the mountains, along the foothills and the plains East of Denver. The first wave of storms is expected in the early afternoon hours and is confined mainly to areas NW and E of Denver. 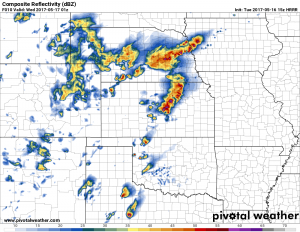 Second wave of storms possible in the evening, again with an Eastern bias. The HRRR model snapshots above show simulated radar for the afternoon and evening hours. Don’t get too caught up in the exact locations of the storms, this radar doesn’t pinpoint those exact locations for storms very well; rather it is good at showing IF there will be storms and what area they may have a bias to form in. The Castle Rock and Palmer Divide area have about a 40% chance of seeing a thunderstorm or two this afternoon so keep that in mind. Severe weather is not largely expected but when we have these quick hitting fronts and storm systems, we can see storms with small to medium sized hail form very quickly. On another note, in that second image… look at those storms in Texas, Oklahoma and Kansas. 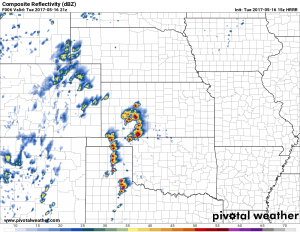 Expecting a pretty significant severe weather day out on the plains East of Colorado! Storm 2: Powerful, Cold and Worth Watching Very Closely! This is the one that have everyone’s attention, mainly because the word “snow” is back in the picture. 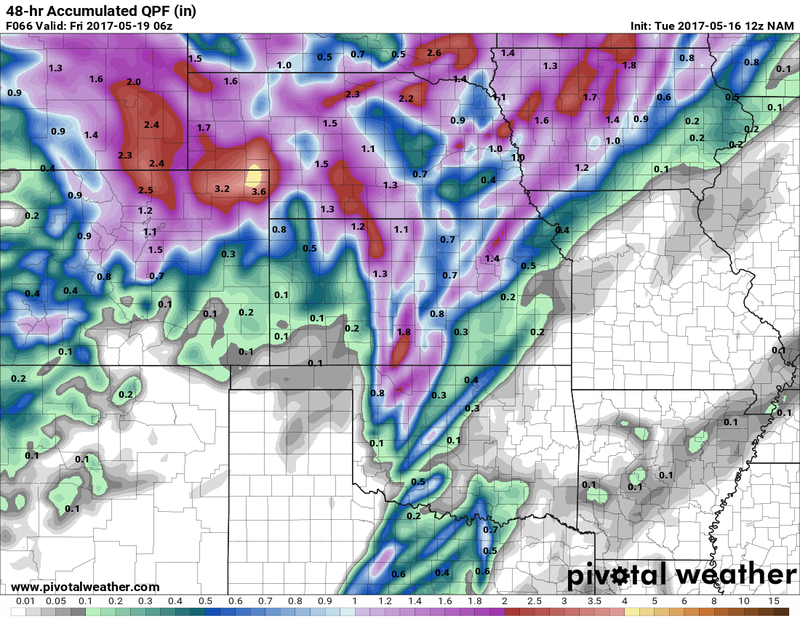 Not only that, but if modeling proves correct, this storm system has the potential to bring significant snowfall accumulation to SOME areas along the front range of Colorado! The storm looks to begin impacting the area late Wednesday into Thursday morning. Modeling show significant precipitation accumulation with this storm! QPF forecast calls for around 1.5 inches of liquid precipitation for the Castle Rock area through Friday morning. Cold air will be abundant with this storm. The main airmass with this storm system originates over Alaska so we know it has cold air coming with it! Friday morning temps show a strong cold front on the eastern plains leaving temperatures in the 30’s along the front range. The cold air and the precipitation have to arrive at just the right time for this storm to be a significant snowmaker. If one or the other is late by a matter of only hours, it can mean the difference between 12+ inches of snow and no snow and all rain. We don’t have a good idea on if these ingredients will come together or not yet. How much snow and what areas get it? Just like our past storm systems with snow, elevation and micro-scale weather conditions will play a huge part in this storm system. If you’ve planted a garden, you may need to cover those plants up Thursday and Friday nights. Temperatures may be cold enough to damage sensitive precipitation. If your sprinkler system are on, anything below ground will be fine. The above ground stuff may need to be covered up though! Freezing conditions are likely Thursday and Friday late with the data we have and some models even show Hard Freeze conditions for higher elevations! 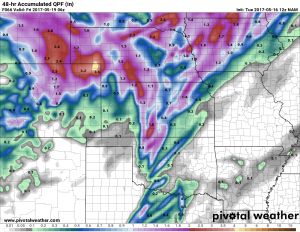 Be careful about TV station hype on this storm; I’ve already seen one or two of them throwing out ridiculous snowfall numbers from one model that just happens to be the only one showing those high numbers. Stay tuned to your favorite TRUSTED weather source for updates on this storm! I’ll keep posting updates as we get more data in on this storm! Stay tuned! 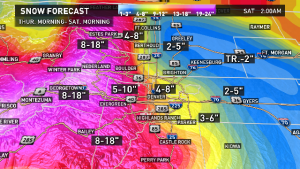 Here’s one TV station’s snowfall totals… it’s way too early to trust totals like this! 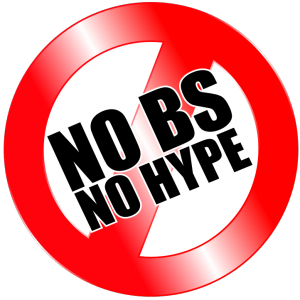 Don’t Believe the Hype! 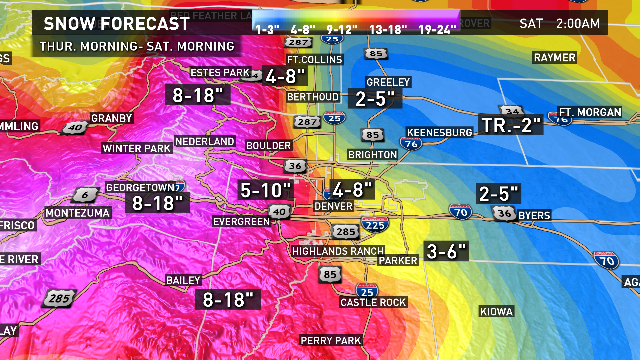 Stick with us at Mountain Wave Weather, we’ll continue to update with no hype and no B.S. !